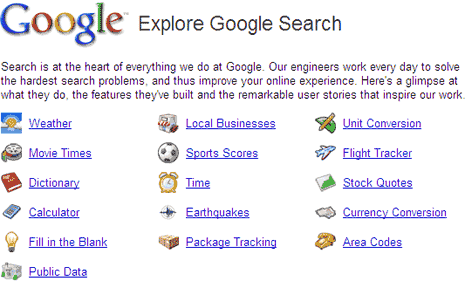 You can use Google to search for latest weather, local businesses, unit conversion, movie timings, sport score, flight tracker, dictionary, time, stock quotes, calculator, earthquakes, currency conversion, fill in the blank, shipment tracking, area codes, public data. If you have not used Google for either of above, hop onto this webpage and see details (or view related video) on how to get going. Google for sure is cool, any questions?